For the meaning of metric prefixes, go here. The unit of electric charge in SI, 1948–present. Symbol, C. The amount of charge transported through any cross section of a conductor in one second by a constant current of one ampere. It is equivalent to the amount of charge on about 6,241,510,000,000,000,000 electrons. Portrait in oils by Hippolyte Lecomte. 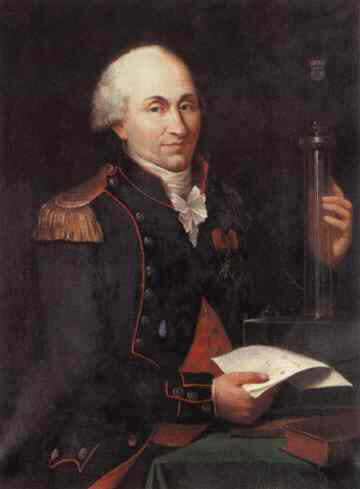 The coulomb is named for C. A. Coulomb (1736–1806), a French scientist. In equations, the symbol for charge is Q. The dimensions of the coulomb, in terms of base units, are amperes times seconds. Earlier definitions of the coulomb parallel the one adopted by the CGPM in 1948. The international coulomb (1893 – 1948), a unit in the International System of Electrical and Magnetic Units, was the amount of charge transported through any section of a electric circuit in one second, when the current in the circuit is one international ampere. On international coulomb = 0.99985 coulomb. See history of the ampere. In the practical system of electrical units, a coulomb was one tenth of an abcoulomb. In the CGS electromagnetic system, an abcoulomb is the quantity of electricity which passes any section of an electric circuit when the current is one abampere.